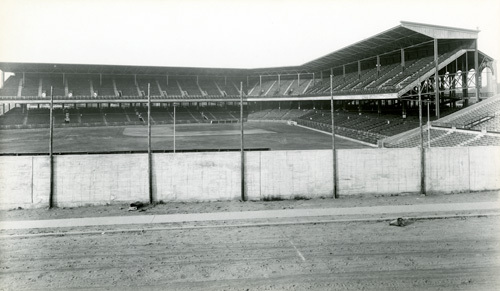 By the time Ebbets Field opened the Dodgers had been a Brooklyn institution for three decades. Originally formed in 1883, the team joined the National League in 1890. Charles Ebbets began working with a team as a bookkeeper in 1883, working his way up to manager and eventually buying the team 1902. Ebbets began purchasing land in the Flatbush section of Brooklyn in 1908, eventually buying enough land for construction to begin in 1912. The stadium was designed by New York architect Clarence Randall Van Buskirk, who included a grand marble rotunda at the entrance of the park. A chandelier made up twelve bat suspending baseball-shaped globes hung in the rotunda. The ballpark closed in 1957, when the Dodgers moved to Los Angeles, and the building was torn down in 1960. An apartment building, first named after Ebbets field and later renamed Jackie Robinson Apartments, now stands on the site.